Every year, I come up with a really long list of new things I want to grow, and often they are not anything that I’ll grow a lot of, but they add that little bit of strangeness and the unexpected that makes farm flowers such a delight. Some varieties make it into the field, and some of those make it onto the rolls for the next year. Here’s a review of these enterprising pioneers. Enjoy! 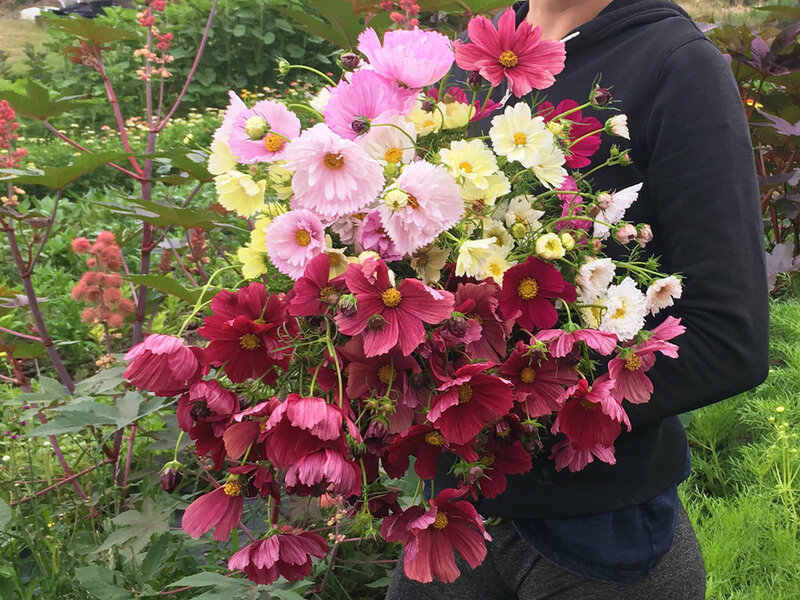 To see last week’s review of 2018 focal flowers, including ranunculus, dahlias, zinnias, chrysanthemums, and lisianthus, click here. Focal flowers get all the cred! But supporting flowers add so much to designs, and there are myriad families and species to explore. This is where I do the most experimentation and have the most fun. Reseda alba ‘White Mignonette’ - It’s great! I took a gamble on this weird plant, and I have to say it paid off! I learned about it from Christin Geall’s Instagram, @cultivatedbychristin. If you don’t already follow Christin, get on the train! She’s an incredible designer and is always incorporating unexpected garden elements into her work. Her feed is a real feast for the eyes. I loved mignonette for its tall, towering white spikes and easy cultivation. It hydrated easily and was a great replacement for veronica in bouquets. I grew the species Reseda alba, though there is another variety out there called Reseda odorata – both look great, but R. odorata looks a bit ‘weedier’ to me. You can find R. alba seeds at Swallowtail, and R. odorata seeds at various outlets, including Floret. I planted it direct, 8 weeks before last frost, in rows 6” apart, thinning to 6”. When it was sending up a central shoot, around 6” tall, I pinched out the growing tip. The plants got quite tall and wide, and could have used netting to keep stems straighter and neater. Stems were very easy to harvest and clean, and added a lot of whimsy (word of the year for all 2018 weddings) to our designs. Cosmos ‘Rubenza’ on the bottom. ‘Rubenza’: A fabulous color, long strong stems that kept on producing. Really useful when you need a burgundy. The color is best when you cut them early. I’m excited to see what the new color ‘Apricot Lemonade’ looks like. You can get seeds from Floret or plugs from Farmer Bailey. ‘Tower’ Series, Chamois & Violet: I’d never had good luck with china asters until this year, when they were excellent! I planted them in half-shady beds and they seemed to love that. I also got them started as early as I dared, sowing seeds indoors 8 weeks before last frost and planting out as soon as the weather cleared. 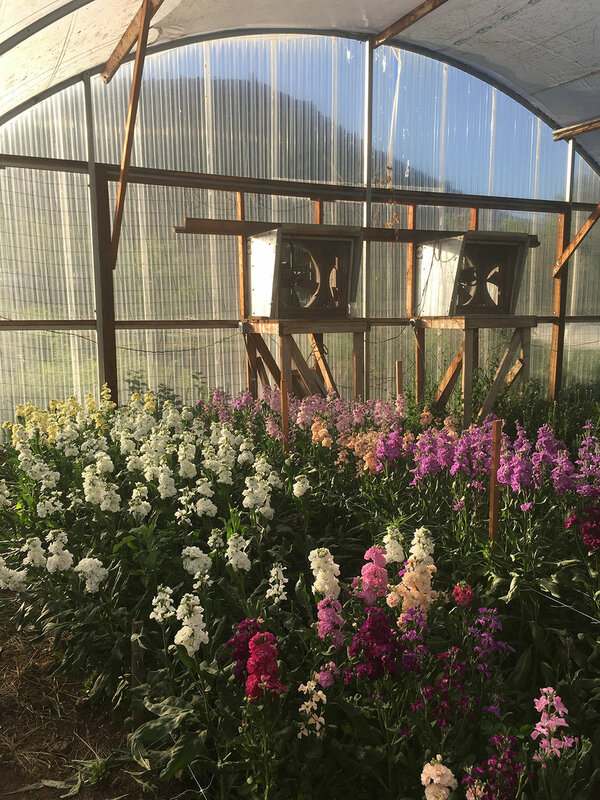 These are day-length-sensitive plants, so they’ll get ready to flower with 4-5 weeks of long days (14 hours or longer), and flowering will be much faster once short days return. I found a really helpful online tool to help you know your day-lengths, HERE. Just put in your zip code and you get a nifty visual chart of how long your days are throughout the year. This is cool if you’re doing a lot of indoor winter growing, too, as most plants will not be actively growing if day-lengths are under 10 hours. You can see when plants will start doing their thing. Anyway, I set my plants outside around last frost and just kind of forgot about them for most of the summer. That meant that they didn’t get netting before they needed it (perennial issue with me, I know), and they got pretty destroyed in our weird summer rains. But they were a great crop before that happened, so fluffy and massive. Though they are a one-hit wonder, I think we could get as many as 3 successions that would get their day-length requirements met, about 1 month apart each. But I know these plant are challenging - believe me, I’ve had my fair share go crispy in the summer heat or completely melt down from an attack of aster yellows. I think they’re worth trying despite all that. I loved the Tower series from Johnny’s – they were perfect. Peony-shaped blooms are hard to come by in late summer, and I truly relished these. I much preferred the ‘Violet’ color to the ‘Blue’, which wasn’t a clear blue but more of a blue-purple. And of course ‘Chamois’ filled my need for a pretty pink. It was a bit more saturated pink than I’d like, so I’m looking forward to seeing the ‘King Size Apricot’, ‘Lady Coral Chamois’, and ‘Lady Coral Lavender’ aka ‘Moonstone’ varieties this year. Since Floret started researching China Asters, a whole world has opened up. I’m very excited by the quill-shaped series like ‘Harlekin’, ‘Valkyrie’ and ‘Gala’ – such interesting forms! Nifty charts - you know they’re my jam! It seems that all the interesting colors of calendula tend to be short. Alas! However, I do still love some of the classic orange and yellows, and their height only makes them more attractive. I’ve enjoyed the scabiosa-flowered types, like the ‘Princess’ series, and lovely doubles like ‘Greenheart Gold’. In my heart, I love orange, but brides and florists do not. Tragedy. My calendula usually get attacked by red aphids, and once that happens it’s kind of silly to keep harvesting them, because the bugs leave gross red streaks down the stems when you strip the foliage. But this doesn’t usually happen until the plants are stressed in summer, so I get a lovely spring crop. The best idea would be to tear those plants out before the infestation happens, and replant a succession, rather than leaving them in all season as I’ve done. Ivory Princess: Lovely plant and heavy producer, but again I wish it were taller. No, it’s not white, but it is a nice creamy, very light yellow that can blend in some palettes and combines nicely with Fata Morgana scabiosa. It’s worth growing. Seeds can be found through GeoSeed and many others. Zeolights: When this variety is fully double, it is a magnificent thing. I used to grow a variety called ‘Triangle Flashback’ from Johnny’s that was very similar, but a bit taller and more double. I’d love to find it again, or it may be time to start selecting tall plants and saving their seeds. They do seem to get taller if they have a bit of afternoon shade. I plant mine at 9x9 – has anyone gone closer for longer stems? I got seeds from Siskiyou. ‘Sunday Wine Red’: A tremendous color, this will join the ranks of the few celosias I really like: Sylphid, Flamingo Feather, Celway Salmon, Chief Persimmon, Cramer’s Burgundy, and Cramer’s Rose. I thought Sunday Gold was a great color as well. This one performed OK in the hottest, brightest section of my field, and I think it would be a real winner on better soil or in the hoop house. All the celosia I grew this year in the hoop was brilliant, and filled me with happiness! It’s one of those crops that is hit-or-miss, and having such a big hit this year was a shot of confidence in the arm. In the hoop house with Celosia ‘Sylphid’, ‘Cramer’s Burgundy’, ‘Chief Persimmon’ and ‘Cramer’s Rose’. ProCut White Lite: I was so excited when I saw this color come out. I am a huge fan of sunflowers in all their shapes and forms, but they are often the wrong color for bridal or florist palettes. This one is still creamy yellow, but it has such a lovely white center with a touch of green that they got snapped up in the design studio. In fact, I never even got a picture of them haha! I didn’t try the black-centered version, White Nite; I’m sure it’s lovely too, but maybe not for my market. All the seed suppliers ran out of White Lite midsummer, so it was impossible to get a second succession in. This year I’m sure they’ve stocked up. Sun-Fill Series: These are definitely weird and they were a gamble for me, but I did love them. If you cut them too late, the little petals will start to poke out onto the disk and make them look even weirder, but I thought they were so much fun, not too much space, and of course inexpensive. I planted these at 6x6”, like I do with all single-stemmed sunflowers, but they came out quite small – I think they could use a 9x9 spacing to get those bigger dramatic heads. At their small size, I felt they often got lost in arrangements. I know, not everyone loves these or even grows them, but sometimes they are just the thing. I actually love the smell – don't ask me why – and I certainly appreciate their pest-repellent qualities. I’m still on the hunt for a white marigold, in vain. This year I tried ‘Savannah Ivory’. While the color was nice, the blooms almost immediately opened to a very ugly center that then turned brown, so the flowers always looked dead. I’ve had better success with ‘Vanilla (Sweet Cream)’, but it’s quite short. I haven’t yet gone for Eskimo. I truly loved two new varieties this year: ‘Garuda Deep Gold’ and ‘Jedi Gold’. They were big, flowered continuously, and had perfectly formed double flowers on long stems. Of course, they are hybrids, so I couldn’t save seed, but I’m looking forward to trying Johnny’s open pollinated ‘Giant Orange’ and ‘Giant Yellow’ again. Stock ‘Quartet Apricot’, showing off its ruffles. You may think that stock might not do very well in our short spring and high altitude, and you’d be very right. I’ve had a lot of failures with stock over the years, but I continue to grow it because its scent is so intoxicating and it provides a softness and bulkiness that I can’t get in other spike flowers. This year I put hundreds of stock plants in my hoop house very early in the season, and our crop was truly excellent. I’ve never had such beautiful long stems. Outdoors, they’ve never done as well, even when planted early, because they shoot up that central stalk early, and without protection, an April snow will crush them, turning their stems into a twisted mess. I’ve experimented with planting them in shade and really tightening the spacing, down to about 3x3”, but the best success has definitely been in the hoop at a generous 6x6”. ‘Quartet’: I only grew a few of these treasures this year, and I was kicking myself for not planting more, and for neglecting to pinch them. They were a bit on the short side, but their florets were so lusciously ruffled, like cake frosting, that I dreamed about them. I can’t wait to plant more. You can get these from Johnny’s and GeoSeed. Floret and GeoSeed are now offering the ‘Vintage’ series, which has one very interesting selection: Copper (Floret calls it ‘Brown’). It looks like one of those hard-to-pin-down colors, like a Distant Drums rose or Roseanne Brown lisianthus. These are bedding stocks, supposedly reaching a max of 10” in height, but the color is so intriguing I’m obliged to give it a try. Cuddling with stock ‘Katz’, ‘Canneto’, and ‘Cheerful’. Early crop of stock in the hoop. ‘Scoop Cherry Vanilla’: This is a tissue-culture hybrid, a cross between the annual Scabiosa purpurea and the perennial S. caucasica. The cross gives it fabulous color and the long, thick stems associated with the perennials. The flowers were slightly larger than the annual varieties. I got mine through Farmer Bailey, and planted them out around equinox. I was extremely pleased with the plants’ productivity – they threw TONS of beautiful long stems, so many that it was hard to keep up with the harvest, in this glorious plum color tipped with white. Once it got very hot, in July, they started throwing weaker stems and uglier blooms. I think that a hard cut-back, to ground level, at this time would allow the plant to regenerate for a second flush in fall. They were definitely a win! I have heard that other colors in this series are underwhelming, which is a bummer, because they’re quite expensive. ‘Merlot Red’: This new color, from Johnny’s, was a true standout for us. The color was terrific – something between ‘Black Knight’ and ‘Fire King’ – very “jewel-toned”. They were extremely popular in the design studio. Long strong stems and good productivity, like the rest of the annual scabiosas. This year, I thought it would be nice to grow some tomatoes and other fruits for ornamental use. I think they got used maybe once in wedding designs, so they may not be a revenue driver. But they were certainly a lot of fun! We grew ‘Sungold’, ‘Indigo Cherry Drops’, and ‘Supersweet 100’, along with a few tomatillos. Thankfully, I had a stellar intern (shout-out to Kailey!) who knew how to trellis, prune, and sucker the plants so they were VERY productive. I think ‘Supersweet 100’ was best for ornamental use, since its fruits stay on the stem and are very beautiful and firm, easy to lay over the side of a compote for a “foodie” vibe. ‘Sungold’ was just absolutely delicious and we could not keep our hands off it – so, I’m not sure if we’d sacrifice it for décor! ‘Indigo Cherry Drops’, while a beautiful color and quite tasty, was a larger tomato with a less-than-perfect growth habit for ornamental use. It was also the least productive of the three. My friend Gina over at Mossflower, who uses all American-grown flowers in her bouquets (hell yeah! ), grew the currant tomato from Floret – I got to see a stem in person and about lost my mind. It’s so stinkin’ cute and perfect for design, and I can’t wait to grow it! You can find similar varieties around the Web – some even come in orange and white. See Gina’s picture of it here. Tomatoes ‘Supersweet 100’, ‘Sungold’, and ‘Indigo Cherry Drops’. Those of us who farm in hot, dry climates, or far from magical foliage forests, often have trouble growing or accessing this key design element. For years, I’ve foraged chokecherry foliage to use as structural elements in designs, and I’ve planted a few measly ninebarks and dogwoods that never quite got going enough to cut from. Us desert-dwellers might never have the big twiggy offerings we’d love, but here are a few ideas that have worked well for me. Places to look for new foliages are in hardy perennial herbs, desert and prairie natives, and the foliage of plants we might otherwise grow for flowers (some folks swear by cosmos foliage). I grew an insane amount of this stuff in 2018, and learned a few things that made it a better crop. I planted it very tight, at 9x9, and it shot up to almost 4’ very quickly. 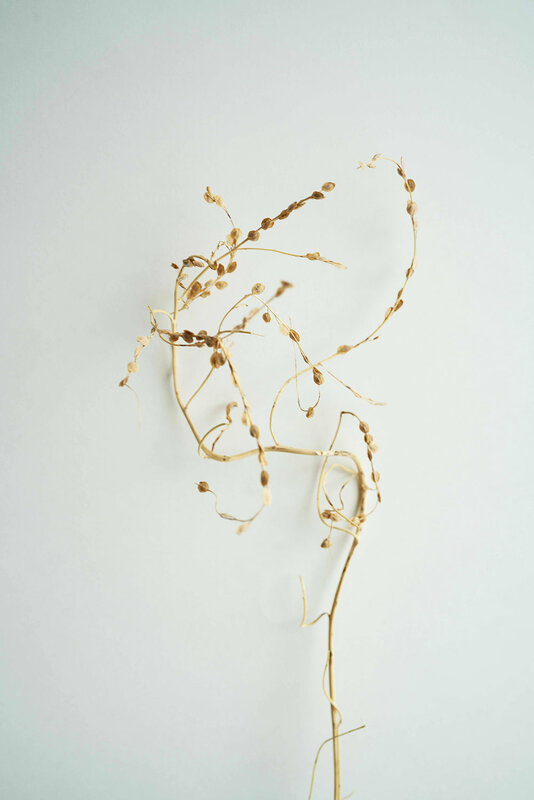 It is slow to grow new stems, but produces so many in the first place that it’s hard to keep up with harvest. 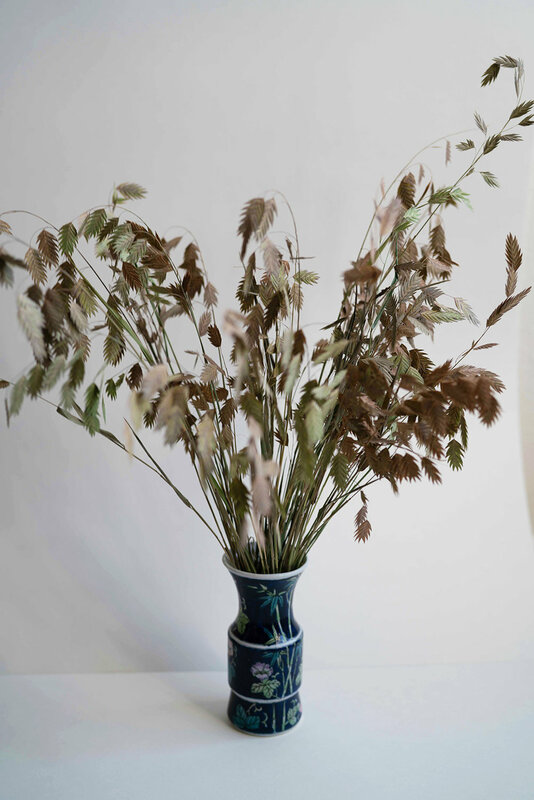 You do have to wait until the stems are woody near the base – otherwise they are prone to wilting. I grew another small crop inside the hoop house, and found that the color was not as intense, and that stems were much weaker. I could not get the stems from my hoop to hydrate with any treatment, whereas the ones from outside did well into straight fresh water, or dipped in boiling water or Quick Dip. I love this foliage and it is the perfect burgundy for those fall weddings. Seeds from GeoSeed. This beautiful perennial herb puts out long towers of white flowers on strong, almost woody stems. I thought they were gorgeous and intricate, and of course, they smelled great. Seeds available from GeoSeed and Renee’s Garden. Other lovely perennial herbs to consider are lemon balm, Melissa officinalis, and anise hyssop, Agastache foeniculum. There are other species out there, including P. muticum and P. virginianum, but I believe P. pilosum is the one you want for cut flower use. I didn’t grow this myself, after failing with it in the nursery, but Kim at CityGal Farms sent a photo in her weekly availability email and my jaw about dropped off. Minty, architectural tops with strong stems on 3-4’ plants?? It looks like a truly worthwhile foliage. Available from Johnny’s. This is Lepidium sativum, from Johnny’s. I’ve tried other varieties in the past, including ‘Attraxa’, but I never had much success, though ‘Wrinkled Crinkled’ looks about the same. This one was a breeze, and the tall stems with their myriad twining seed heads were just magic. As a bonus, they dry in a beautiful cream color that’s perfect for twiggy wedding palettes or fall wreaths. I had the best luck drying them on the plant, or cutting and drying them in the hoop house, where the sun bleached them. If hung in the dark they just go dry and kind of green-brown, and get really brittle, too. Again, I got inspiration to grow this from @cultivatedbychristin. I first started these indoors, quite early, and had them out under row cover by the end of March, at 6x6”, and had seed-heads ready to cut by mid-June. I planted other successions, direct-seeded, which worked just as well in rows 6” apart. These plants grew into 4’-tall monsters! The seeds heads were quite top-heavy and began to bend over – they really needed netting, but all we could manage was an emergency corral. Once cut down from their stems, they stood up better in the bucket and were really fun to use in designs, and filled out market bouquets. I did notice some flea-beetle damage on the leaves, but since we weren’t selling it for edible greens, I let this go and they produced seed heads just fine. Insect netting would be a way to avoid this in the future. Just as beautiful and versatile when dry. So many fun shapes and gestures! Artemisia, AKA Silver Sage, AKA Prairie Sage, Artemisia ludoviciana. I love when I am able to use prairie natives in the garden, like echinacea and yarrow. I got this seed from Prairie Moon Nursery, and the little plants grew really well for me after I sprouted them in moist sand in the refrigerator for about a month. They were teeny tiny when I put them out, but by July they had big tall silver spikes and started budding up, making the most interesting foliage. They were easy to cut and hydrate, and very productive. As a perennial, they do seem to be a one-cut deal, and if you let the flowers fully open they will turn brown and become less attractive. Overall, a great investment and a beautiful, interesting foliage that didn’t need much water. I’ve seen other cultivars out there, including ‘Silver King’ and ‘Silver Queen’ – ‘King’ looks most attractive to me; does anyone have experience with these? Very sorry I wasn’t able to snap a pic - they’re lovely! Safflower foliage, behind the equally wonderful apple mint. I love to grow this for the flowers, little mohawks of color, but found that, cut right when it begins to bud up, it makes a fabulous, indestructible, deep green foliage that filled out bouquets and provided tons of structure to compotes & other table arrangements. This was probably the most exciting discovery I made all year (yes, what excites me is a bit strange). The stems are super strong and it’s easy to direct-sow, so even though it’s a one-and-done, it’s worth planting in succession. I did find that germination was reduced by warm temperatures (or maybe I was neglectful while they were germinating). The first seeds went into the ground in early April, in 6” rows, seeds about 3” apart, and the resulting plants were definitely the strongest and tallest of the successions, though later plantings were more than acceptable. Highly recommended as an easy annual foliage. Just a few, for your weirding-out pleasure. I love to grow the unexpected, whether it’s giant castor bean spikes or tiny little grasses like rye brome. 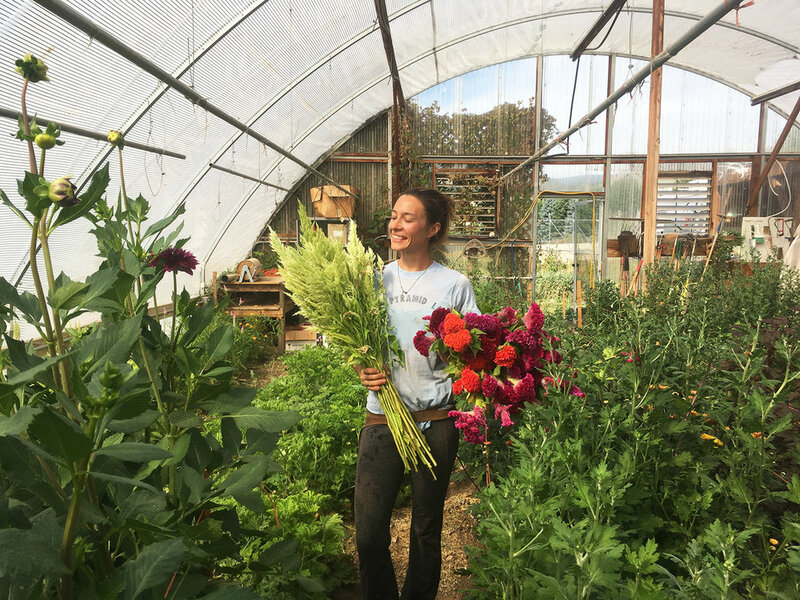 I also love foraging, because you find inspiration for what grows well in your climate, and the most delicate, perfect wildflowers to include in special designs, from wild lupines to yucca florets and milkweed pods. You don’t have to grow fields and fields of these unusual and striking creatures, but a dedicated corner or two offers a creative spark and a way to set your designs and offerings apart from the rest. 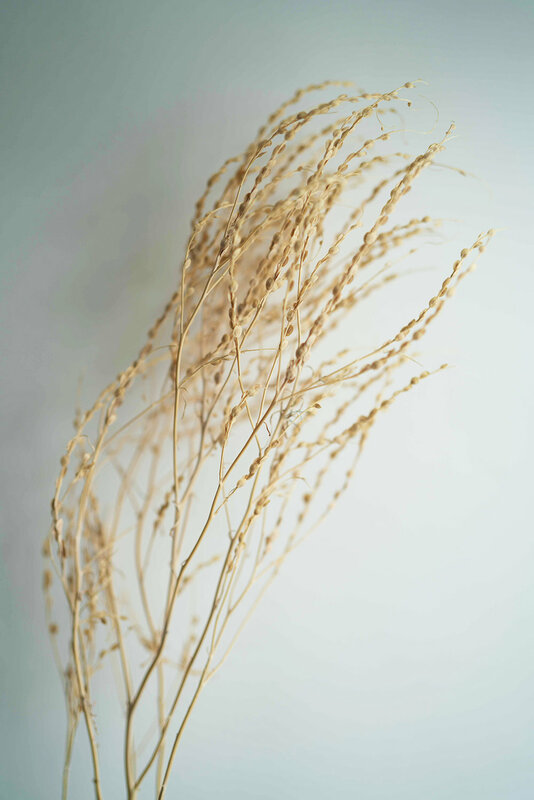 I grew these perennial grasses from seed and planted them out last fall, and I was so impressed by their productivity this year. They are in a fairly neglected part of the garden, and even so they were very healthy and produced many stems per plant. Next year they’ll only get bigger and better! I think a 12x12 spacing is best for these. Seeds from GeoSeed. Lovely & intricate, with lots of color variation. Jewels of Opar, Talinum paniculatum. Garden Huckleberry ‘Chichiquelite’, Solanum melanocerasum. These were a strange whim, one of those midwinter purchases that makes you wonder about your own sanity when you come to it on the seeding list in the spring. They are related to tomatoes and peppers, and I thoroughly enjoyed growing them. They sprouted up into large plants bearing tons of sculptural berries, but were best used with the leaves taken off and before the berries ripened, as they tended to break and smear easily. These were certainly fun but I don’t know if I’d grow them again - a bit too much trouble for not enough gain. They might be great for jams though! I got seeds from Baker Creek. Hyacinth Bean ‘Ruby Moon’, Dolichos lablab. Ok, I know this one isn’t that weird, but I just wanted to give a wholehearted plug for this humble bean, even if you don’t like vines and have no patience for trellising. This is a crop that really pumps out stems, and they are long stemmed, too, without any of the hemming-and-hawing that goes into growing long-stemmed sweet peas. As a bean, they are vigorous and eternally healthy, and when flowering ends, they form the most beautiful purple pods that add startling texture to late-summer and early-autumn arrangements. Seeds are easy to save: let the pods dry on the plant, then thresh and winnow to clean. Seeds can be found from nearly all the usual suspects. Peacock Orchid ‘Murielae’, Acidanthera bicolor. This perfect, tropical-looking gladiolus is one of my favorite things. It looks so delicate and striking that it doesn’t seem possible we could grow it here in Colorado, but it relishes our hot summers. It’s a bulb crop, but the bulbs are cheap, and can be lifted in the fall and overwintered much like dahlia tubers. I recommend planting huge swaths of them anywhere and everywhere! Bulbs can be had wholesale through Gloeckner and retail through many outlets. Glorious hyacinth bean, Dolichos lablab. Tropical-looking Peacock Orchid, Acidanthera bicolor. And one last weird thing to ponder: would you use a white cynoglossum (Chinese Forget-Me-Not)? I would… I was devastated that this rogue bloomed too late to make seed! I hope you found something weird in this post to inspire you this season. Please share any thoughts you might have in the comments :) Next week, look for a list of new flowers I’m most excited about trying in 2019.